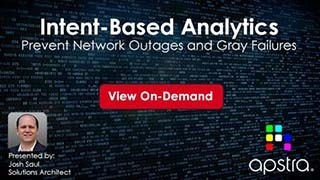 Intent-Based Analytics (IBA) is automated big data analytics designed to cut data center network outages and gray failures by at least 50%. It liberates network operations from consuming raw telemetry, writing and maintaining complex and brittle rules to keep up with ongoing network changes, and staring at network visualizations 24x7 in order to detect unusual patterns. 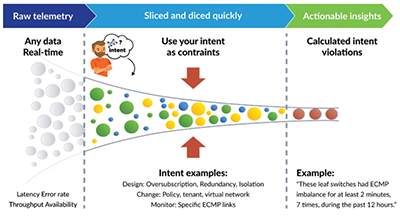 Intent-Based Analytics enables network architects and operators to create high-level conditions for alerting on any set of telemetry from the network. The conditions are defined from user intent, so they are constantly updated when new devices or policies are deployed in the network. IBA "probes" can combine multiple conditions to minimize false positives and provide more relevant context, thereby decreasing operating expenses and eliminating unneeded troubleshooting. Any condition that can be described by the operator can be turned into a probe that will be checked 100% of the time without additional work. In this webinar we will provide an introduction to the exciting capabilities of this feature.